Just in case you’ve been living under a rock and haven’t heard about it yet, prepare to join the mass obsession, because the internet is going absolutely crazy today trying to figure out who could be inside this Porta-Potty. Ever since a user posted this photo on Imgur last night, the web has been ablaze with speculation about who’s in there, with some of the most popular theories suggesting that anyone from Emma Stone to a grade-A bodybuilding hunk could be hidden behind the portable toilet’s plastic door. Whoever it is, they like to use the bathroom in private. He (or she!) probably lives nearby. 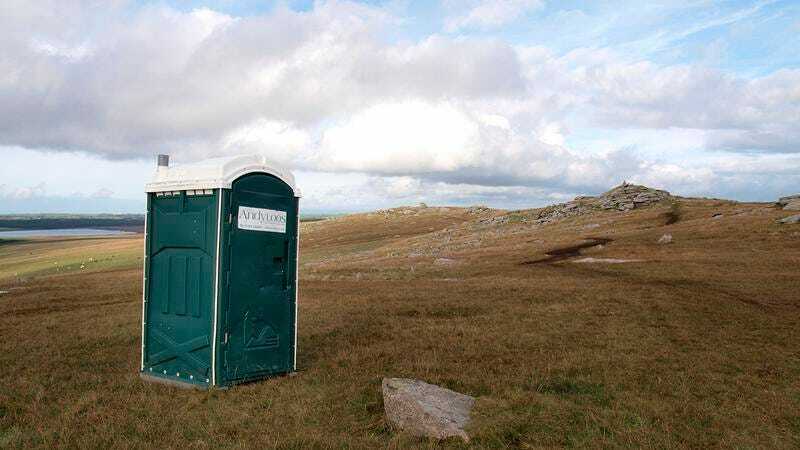 They are no bigger than the standard dimensions of the Porta-Potty—44 inches wide and 88 inches tall. So, who could it be? Is it Harry Styles? Is it some sort of plumber? The jury’s still out, and there’s a small vocal subset of users who have made a convincing argument that the occupant could be an old man or a very short woman! One thing’s for sure: As long as this remains a mystery, there’s no way we’re getting any work done. Keep digging, people—the world has got to know!